Realizing I only had one functional black dress decided to fix Butterick 5606 the infinity dress, which I code named the samurai dress because of the extremely long ties. Don't get me wrong a pretty dress if you can keep the ties just right, also did not like that the ties are sewn at the side seams at the hip... giving me the feeling of bat wings on my hips. 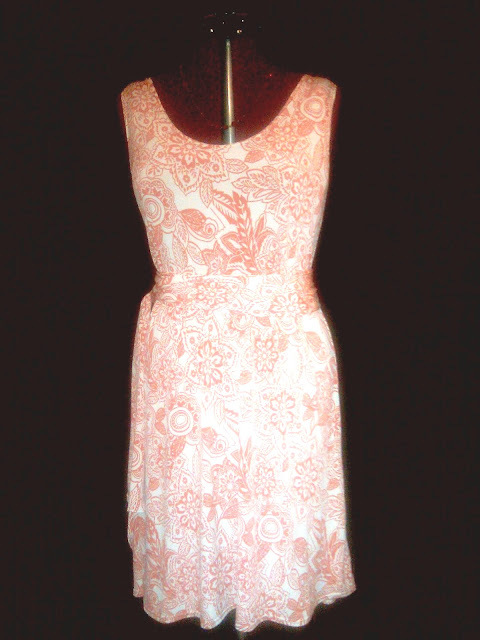 I still want an infinity dress and plan to make the one I did for my daughter Burda 7352 . B5606 will definitely be made again minus the ties. Prior to making the dress exactly as pictured on the envelope, I'd made two dresses from the same pattern minus sewing the ties to the side seams and instead made independent sashes. The style line of this dress is simple and can be dressed up or down and accessorized without the ties sewn to the side seams. These dresses worked well last summer and looking forward to donning them again. paired with a Target cardigan and a hot pink skinny belt from my daughter. made for a comfortable outfit today. Why are you always making things that point out the holes in my own closet! Oh well. This looks great. Never gave a second look at that pattern; now that I see your versions, I think I have to get a copy! Very nice! all of them! Thanks for the reminder to make this dress with the ties separate! I need to make a summery knit dress, anyways. A great dress and a wonderful addition to your wardrobe. Amazing dresses. I just bought the tie dress pattern for my daughter. These are all really pretty. You're styling is impeccable as always. You are the undisputed queen of stunning knit dresses. You make something simple look so gorgeous and I'm very envious. I like the reconstruction you did. Sometimes all of the extras are to fussy. Simple is enough, then you can add all the extra fluff with accessories, which you did quite well, I might add! What a great outfit--that pink belt makes it perfect. Very, very nice and lots of options...what more can a girl ask for!! Great save! A very versatile dress. Looks wonderful. Sheila as a matter of fact Simplicity 1849 is not only similar to the pattern I used, it's actually the same exact pattern. I bought 1849 too thinking it was an easier/quicker version but found that its identical. I love the pattern but thought 6 pattern pieces is a bit much for a knit top. Shoot, I make jackets that have only 8 pieces. However, I loved the first top so much I had to make it two more times. Oh! I can see that you love dresses as much as I do! You look lovely in this dress. It's so versatile. Can one every have too many of these? I think not! Great work! So funny, Sheila! 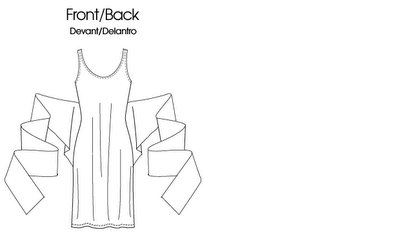 You took the "infinity" dress back down to its bones and made it more versatile than "infinity"!